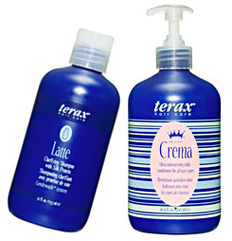 Terax Crema – Hall of Fame Worthy? Pros – this is one of, if not thee, best hair conditioner out there. TERAX has revamped their whole line. I have always really liked their Shampoos ($20) and Conditioners ($20-$48) so I am focusing on those right now. They were already fantastic so I don’t know how they could have improved perfection. Well they added a new exclusive Gentlewash System to the five Shampoos. This makes each sulfate free so it doesn’t strip the hair and helps preserve hair color. And since I only use sulfate-free shamps, this is a treat! Also new are the bottles. All the styling products are a seafoam green and the shamps and conditioners are a true blue color. Look for features of their styling products in the coming months. All @ teraxhaircare.com.